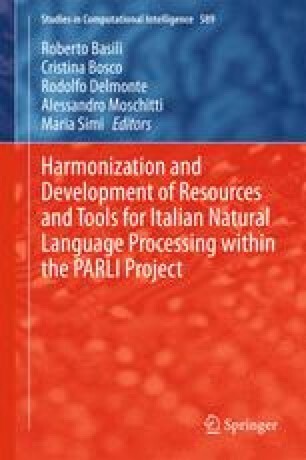 In this paper we address the challenge of combining existing CoNLL-compliant dependency-annotated corpora with the final aim of constructing a bigger treebank for the Italian language. To this end, we defined a methodology for mapping different annotation schemes, based on: (i) The analysis of similarities and differences of considered source and target dependency annotation schemes; (ii) The analysis of the performance of state of the art dependency parsers trained on the source and target treebanks; (iii) The mapping of the source annotation scheme(s) onto a set of target (possibly underspecified) data categories. This methodology was applied in two different case studies. The first one was aimed at constructing a “Merged Italian Dependency Treebank” (MIDT) starting from existing Italian dependency treebanks, namely TUT and ISST–TANL. The second case study, still ongoing, consists in the conversion of the MIDT resource into the Stanford Dependencies de facto standard with the final aim of developing an “Italian Stanford Dependency Treebank” (ISDT).